This phased implementation was originally planned to commence in July 2016 with the release of terminologies, or so-called controlled vocabularies, and organization identifiers. Information update: Currently the SPOR Task force (formerly known as EMA ISO IDMP Task Force) is working primarily on the RMS and OMS, which means Referentials and Organizations, for which User Acceptance Tests are scheduled for the autumn of 2016. Following that, it is now expected that the EMA ISO IDMP implementation guidelines will be issued by the end of Q1 2017. This presents a one-year delay in the start of iteration 1, vs. the original timing. 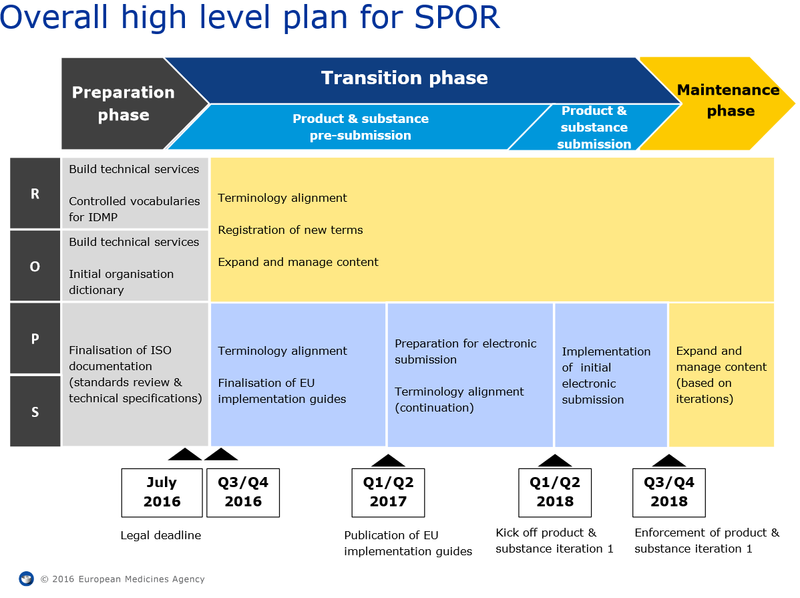 Once implemented, EMA will replace its current data submission format, the eXtended EudraVigilance Product Report Message (XEVPRM) format, with the HL7 SPL format based on the ISO IDMP standards, ISO IDMP technical specifications and HL7 common product model. In her presentation Deborah pointed out that this phased approach has its benefits, but also presents some challenges: The benefits include more achievable timelines, increased time to gather and normalize data, and the opportunity to engage with stakeholders in a more business focused approach. With the phased approach, the implementation can be better aligned with existing company RIM implementation roadmaps, while the introduction of the EMA SPOR model supports company internal Master Data Management strategies. The challenges include the increased complexity of the overall program, a wider focus, lower annual budget and less dedicated resources. This phased approach imposes an increased data exchange with the agency (gateway) – iterative and additive (non-synonymous versions). In addition, a staging repository will be required for sub-set data. The iterative delivery of the modular IDMP solution will require increased validation and migration effort, an increased number of revisions, rollouts and SOP trainings. Substantial stakeholder management engagement is required as well. Aligned with the introduction of IDMP, the IDMP and Master Data Management process is also introduced to take care of the related data elements. Deborah Cooper explained that IDMP requires a new generation of RIM systems. While the first-generation RIM systems only supported local command and control and the delivery of XEVMPD data to the EMA, the RIM systems of the second generation have to be able to handle pharma products, packaged products, medicinal products, marketing authorizations, manufacturers, substances, strengths and clinical data on a regional basis for ISO compliance. In turn, RIM systems of the third generation will have to go beyond the regional approach and handle globally compliant master data. These new RIM systems require comprehensive internal data management, standardization and data governance, which exceed the boundaries of the traditional older generation systems. Data: What data exactly is required (mandatory/conditional/optional)? How difficult is it to find? What is the process for missing data? What is the data quality like? Can you leverage your current XEVMPD strategy? Should the data be transitioned manually or by electronic “ETL” (extraction, transformation and loading)? Systems: Which systems contain the data? How much transformation of the data source is required? What is the most pragmatic solution for the ISO IDMP system? What impact does this have on the overall RIMS roadmap? Processes: What is the impact on the current process? What can be done to avoid rework? How should you define the maintenance process? What impact will this have on new regional adoption of ISO IDMP? People Change Management: What cross-functional engagement will be required? If the possible sources of information cannot be identified in step 2, the percentage of such information should be determined and considered in the final portfolio analysis. Executing this assessment, customers may find the following results, based on GENPACTs experience: XEVMPD data elements make up approximately 33% of the new ISO IDMP Standard. Between 80-94% of information required for ISO IDMP can be derived from systems and documents or from validated external sources. 6% of fields are still not confirmed by European Medicines Agency, 19.2% of fields are associated with Medical Devices. 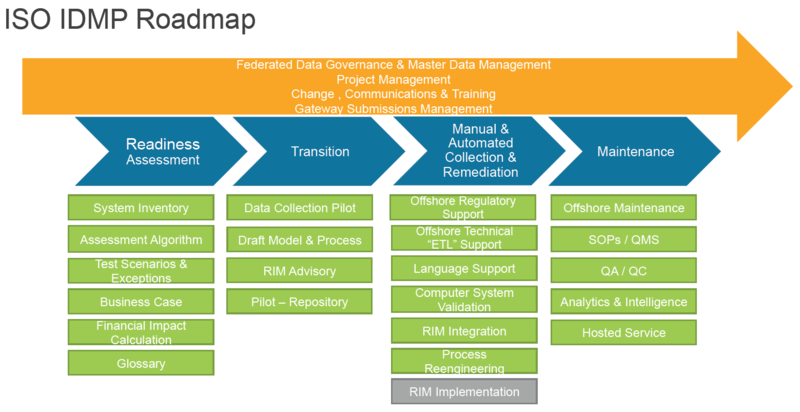 As shown in the figure above, GENPACT has developed a complete ISO IDMP roadmap for customers, starting with the readiness assessment, continuing with a transition phase followed by the manual and/or automated collection of data phase and finally ending with the maintenance phase. So coming back to the initial question: What comes first, RIM or IDMP? My answer would be: They go hand in hand, but from the very beginning data quality is crucial, so this is what really comes first! No matter which timeline and which approach companies take: high quality medicinal product data will always help! Written by Ernst Lange, Global Key Account Manager at LORENZ Life Sciences Group.